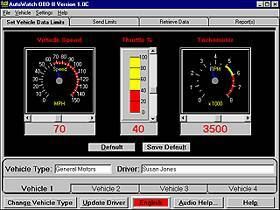 Using the OBD II AutoWatch Software, enter the maximum value you will permit for vehicle speed (MPH/KPH), throttle position and engine speed (RPM) (if you desire to monitor any of these items) and send these limits to the AutoWatch unit through the PCs serial port. Next, disconnect AutoWatch from the PC and place it in the vehicle. AutoWatch is now ready to monitor the vehicle. 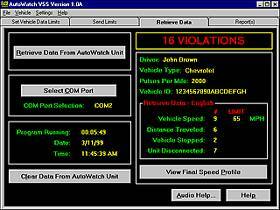 If any of the limits sent to the AutoWatch unit are exceeded by the vehicle, AutoWatch records it. The date, time, length of time the limit was exceeded and the maximum value of the parameter during the violation period will be stored by the AutoWatch unit. Parameters always monitored include: Vehicle Off, Vehicle Running, Vehicle Stopped, Distance Traveled, Unit Disconnected, and Unit Reconnected. Over 1400 violation blocks can be stored by the AutoWatch unit. When you are ready to view what AutoWatch has witnessed, connect AutoWatch to the PC. Using the AutoWatch software, retrieve the data from the AutoWatch. You will immediately know the times the vehicle was off, running, stopped, the total distance traveled and how many times the limit was exceeded for each monitored item. You now have the option to view, print or save reports of the information that was collected. AutoWatch also saves the last 25 seconds of vehicle speed. This information is used mainly for accident investigations. This information can be viewed as a graph in the Vehicle Speed Graph Screen after data retrieval or in a report. You may be thinking, all the driver has to do is disconnect AutoWatch from the vehicle while they are driving and reconnect it when they get back. We have that covered. If AutoWatch is disconnected from the vehicle, it knows and so will you. When it is disconnected, it records the date and time it was disconnected and reconnected. Disconnecting the unit does not erase the information stored in the unit and the information remains stored until it is cleared with the AutoWatch software, which is password protected. NOTE: We have been asked how does AutoWatch know the date and time? The AutoWatch unit has an internal clock. Each time you download to the AutoWatch unit from the PC, the PC's date and time is sent to this clock. The AutoWatch unit has an on-board battery for the clock so that it keeps accurate time. 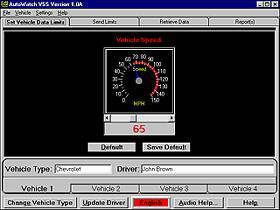 Using the VSS AutoWatch Software, enter the maximum value you will permit for vehicle speed (MPH/KPH) and send these limits to the AutoWatch unit through the PCs serial port. Next, disconnect AutoWatch from the PC and place it in the vehicle. AutoWatch is now ready to monitor the vehicle. If the speed limit sent to the AutoWatch unit is exceeded by the vehicle, AutoWatch records it. The date, time, length of time the limit was exceeded and the maximum speed value during the violation period will be stored by the AutoWatch unit. Parameters always monitored include: Distance Traveled, Vehicle Stopped, Unit Disconnected, and Unit Reconnected. Over 1400 violation blocks can be stored by the AutoWatch unit. When you are ready to view what AutoWatch has witnessed, connect AutoWatch to the PC. Using the AutoWatch software, retrieve the data from the AutoWatch. You will immediately know the the total distance traveled, how many times the vehicle was stopped, how many times the limit was exceeded for each monitored item and how many times the unit was disconnected. You now have the option to view, print or save reports of the information that was collected.